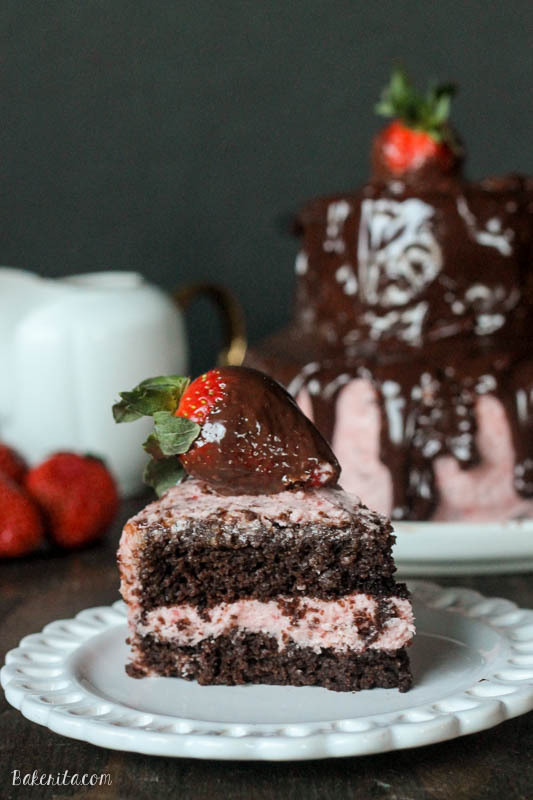 This Mini Chocolate Strawberry Layer Cake is a small tiered chocolate cake filled with fresh strawberry buttercream and topped with chocolate ganache. It’s the perfect dessert for Valentine’s Day, or a small celebration. Sooo…I’ve been thinking about this cake for a while. It’s been a lingering recipe idea for long, but I’ve been holding off until Valentine’s Day to make it happen. And it’s here! We’re 2 weeks out, so the cake has finally been made. It’s nothing novel, or extraordinary, but it’s darn adorable and tastes amazing, especially if you adore the combination of chocolate and strawberry like I do. And it’s mini! That word alone makes me about 20x more excited about anything. I have an addiction to tiny things, an addiction that was most definitely inherited from my mom. Those tiny little Vaseline jars that have been coming out recently? Tiny candles from Bath & Body Works? Baby shoes? Oh, how I love them. I can’t get enough. Seriously – little jars of petroleum jelly can make me go awww. So naturally, the idea of a baby version of a cake highly appeals to me. And when I found not only a 6-inch cake pan, but also a 4-inch one, I couldn’t help but think that the only thing cuter than a tiny layer cake is a tiny tiered layer cake. I think I was right. Now, this cake will still feed a pretty decent number of people, but it’s never not as overwhelming to finish as a normal layer cake. This one will happily feed a party of about 6-8 people, I’d say. Give or take a few depending on appetites. BUT you can totally make it for Valentine’s Day, and you’ll be happy to have leftovers. Okay – and most importantly, how does it tastes? It tastes delicious. Oh my goodness, it’s so good. The chocolate cake is dense, dark, rich, moist, soft, and delicious. It also comes together soooo easily. It’s definitely one of my go-to easy chocolate cake recipes. And the frosting. It takes a tad bit more work than most frostings, but that’s because to get a true, amazing, fresh strawberry flavor, you need to take the extra step to puree the strawberries and reduce them down. It’s an extra step, but I promise it’s so worth it. Many other recipes for strawberry flavored frostings call for artificial flavorings like Jello (yuck – gimme some freshness!) or use preserves or fresh berrries, which tend to give the frostings a super weird texture. By reducing down the berries, we concentrate the fresh taste of the strawberries and get rid of the water that causes the frosting to go all weirdly textured when fresh fruit is added. 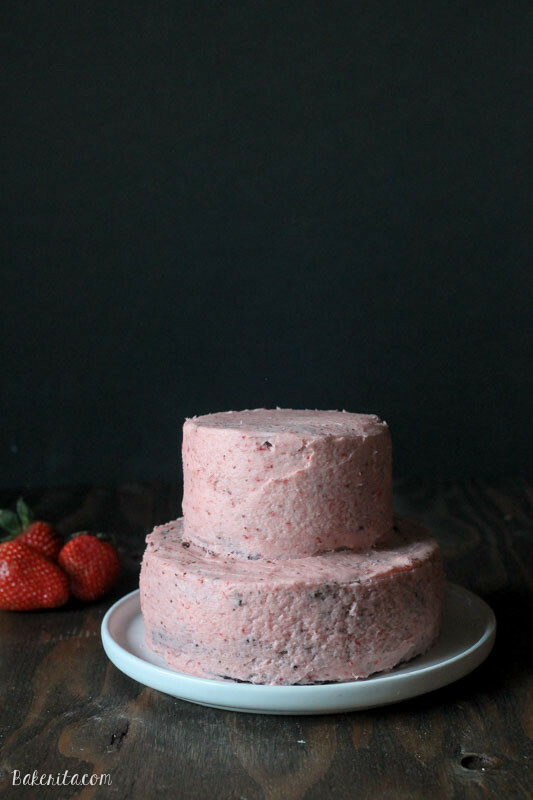 Trust me – the extra step is totally worth it for a delicious buttercream that tastes sort of like strawberry ice cream. Seriously. So. Good. I drowned the whole cake is a rich coating of chocolate ganache. I’m not the best at pouring ganache, and I think mine was too thick, so ignore the subpar chocolate coating. I promise – what it lacks in beauty it makes up for in taste. The chocolate on top gives the whole cake that chocolate covered strawberry vibe, which is, of course, enhanced by the actual chocolate covered strawberries on top. 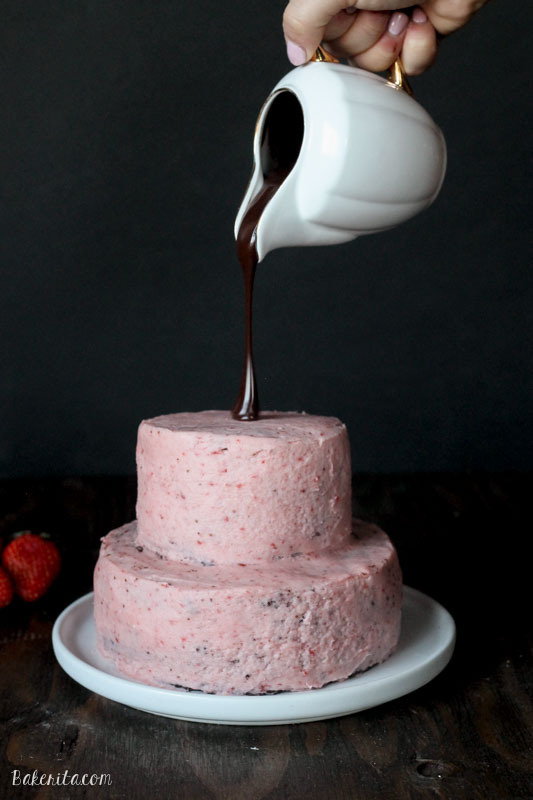 This cake is so lovely, and so perfect for Valentine’s Day, or any other time you want to confess your love to chocolate and strawberries (and mini things). Also…in honor of Valentine’s Day, I have a giveaway to show you all how much I love you. I’ve partnered up with some of my favorite food bloggers to give away a $300 Amazon gift card. Enter through the giveaway widget below. Good luck! Update: winner has been chosen. Thanks to everyone who entered! Preheat oven to 350ºF. Butter two 6-inch round cake pans (or one six-inch pan and two 4-inch pans for a tiered cake, like I did), and dust with flour, tapping out excess. Combine flour, granulated sugar, cocoa, baking soda, baking powder, and salt into the bowl of a mixer. Mix on low. Add eggs, buttermilk, warm water, oil, and vanilla. Beat on medium speed until smooth and completely combined. Divide batter evenly among pans. Bake until cakes are set and a toothpick inserted into the center of each comes out clean, about 25 minutes. Let cool in pans set on a wire rack for 15 minutes. Turn out cakes onto racks, and let cool completely. Place strawberries in a blender and puree until smooth. Pour strawberry puree to a saucepan over medium heat. Bring to a boil, stirring often, until puree is reduced by at least half, about 20 minutes. Remove from heat and cool completely in the refrigerator. Beat butter with an electric mixer in a bowl until it is considerably paler and smooth, about 3-4 minutes. Add 1 cup powdered sugar and combine until blended. Beat 2 tablespoons strawberry puree and vanilla extract into butter mixture until just combined. Alternate between adding the powdered sugar 1 cup at a time and strawberry puree 2 tablespoons at a time until you have used all of the sugar and strawberry puree. Mix on medium speed for 2 minutes, until fluffy and creamy. Once your cakes are completely cooled, level each cake so that the top is flat with a long, thin knife or cake leveler. If you only have one 6-inch cake, cut the cake layer into two thinner layers. Place one cake layer on a cake plate, add about 1/3 cup frosting and spread evenly over the layer. Top with the second cake layer. Frost the entire cake thinly, and place in the freezer for about 15 minutes to let the frosting set. If you have the two 4-inch cakes, repeat the previous steps with the two smaller layers. After letting the crumb coat set, frost the cake normally (both sizes if applicable). If doing the tiered cake, carefully use a bench scraper or spatula to place the mini cake centered on top of the 6-inch cake. Place back into the freezer to set for another 15 minutes. After the frosting has set, make the chocolate coating. In a microwave safe bowl add the chocolate and cream. Microwave on high for 30 second intervals, stirring between each until melted and smooth. 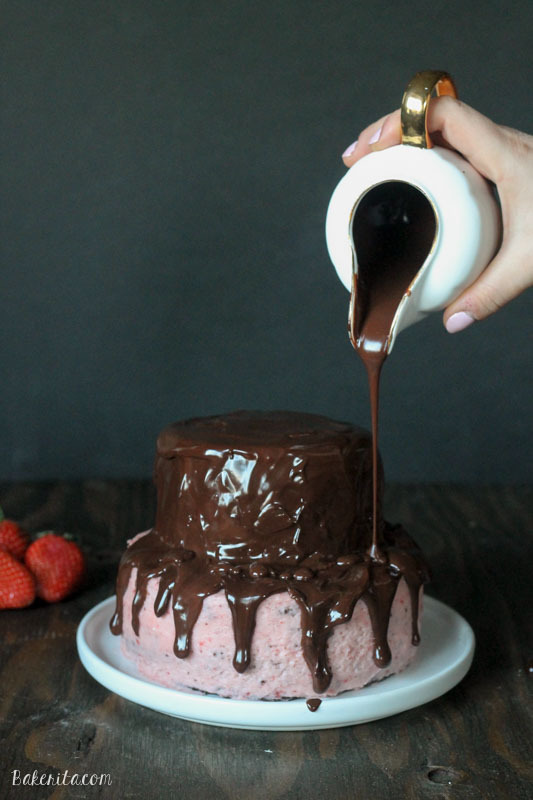 Allow the chocolate to cool for about 3-5 minutes, and then pour the sauce (reserve a small amount to dip strawberries) onto the middle of the cake and spread to just the sides, allowing the sauce to drip down the sides of the cake. Dip strawberries in leftover ganache and place on top of cake. Place the cake in the fridge for at least 1 hour (or overnight) until the chocolate is completely set and the frosting firm. Let set at room temperature for 30 minutes before serving. Oh I just love this cake. I can see why you were thinking about it so much. It is quite lovely! Wow! This cake is gorgeous, Rachel! I love the fresh strawberry buttercream and all of that ganach. SWOON! Rachel, we both made strawberry cakes today!!! I personally love yours because of the chocolate ganache, which is always winning in my book!!! LOVE this!!! You are so talented! This cake is seriously a work of art!! And I totally agree – tiny things are just so much better! :) Happy Monday! Yes! Mini automatically makes things 2 times better. I love the idea of a true strawberry frosting. I can only imagine how worth it it is! Pinned! This cake is beautiful Rachel! And I love the strawberry chocolate combination! So cute! Pinned! I have seen those mini vaseline jars, and they are just too darn cute! I go a little nuts in the travel size section at target. Little containers of q-tips, tiny bottles of hair spray, teeny mouth wash jars. I love them all! This cake looks just amazing Rachel! And these pictures are gorgeous. Perfect for Valentine’s Day. I could go so crazy in the Target travel section :) thanks so much for your kind words, Natalie! This is one show-stopping cake! I like that you made it mini, because first, it’s super cute, and second, it’s rare that I need a full-size layer cake sitting in my kitchen! 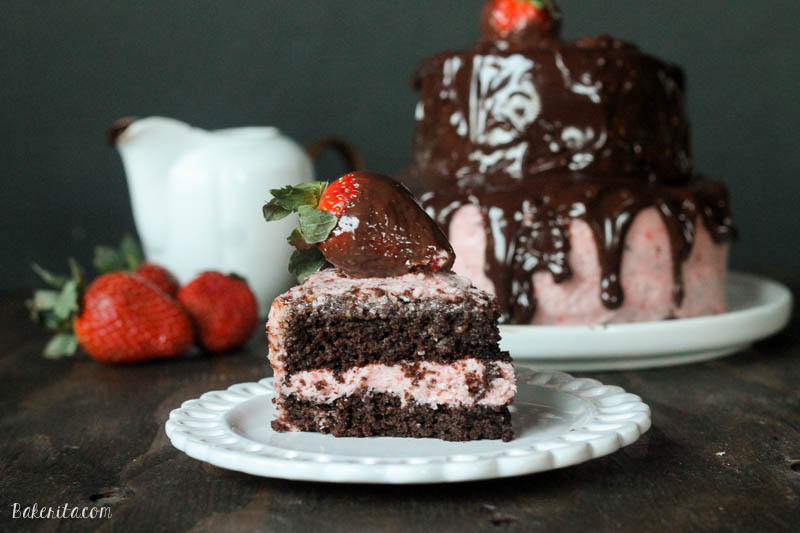 The chocolate-strawberry combo looks just perfect. Pinned! Big layer cakes get so overwhelming when there’s not tons of people to eat them! This one is much more manageably sized :) thanks, Kristine! Chocolate and strawberries is the best combination for a cake I think. This looks beautiful too – really well presented. Gosh your desserts amaze me! This cake is beyond words. I wish I could trip and faceplant into it. Pinned! omg this cake looks so gorgeous and totally delicious!! Love it! This cake is stunning, Rachel! I love mini cakes, they’re so much cuter and more fun to eat :) The chocolate and strawberry combo sound perfect for Valentine’s Day! And that ganache!! OMG swoon! I’m dying to get a piece of this delicious cake! Omomomomom! Oh my gosh—if I made this for Michael he’d propose to me again!! It’s everything he loves!! What a pretty cake!! 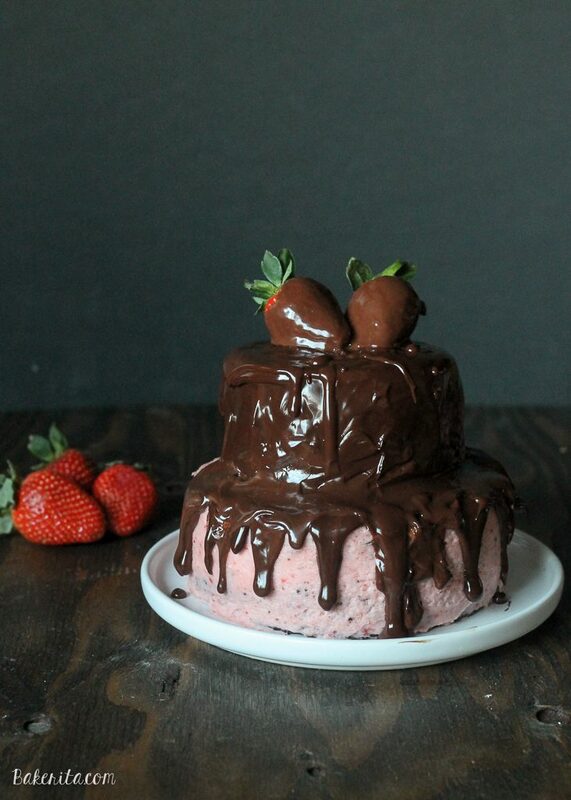 There’s just something about chocolate + strawberry that is just sooo good. And I love that it’s smaller! Mmm . . . Chocolate and strawberry is one of my favorite combos. The ganache just takes this over the top and I so want a slice right about now! What a sweet little cake, and I love that image of the chocolate being poured over the top! Such a fun Valentine’s Day idea! I cannot tell you how stunning this cake is! Absolutely beautiful! Pinned! Oh my gosh, could this cake get any more adorable and swoonworthy?! I’m dying over how fabulous those strawberries look with that wicked-good chocolate ganache! I think it is safe to say that I NEED this cake! As a huge strawberry lover, I’m pretty sure I wouldn’t be able to eat just one piece. And the chocolate ganache takes it over the top! What a beautiful cake! Love the strawberry buttercream! Oh. My. Goodness. How clever of you to reduce the strawberries for the buttercream! And to top it with chocolate covered strawberries? Beautiful! That chocolate!! I want the whole darn thing! Thank you!! Mini cake pans are the cutest – mini baked goods are so fun to play around with! Yum! I adore chocolate and strawberry together. THank first shot of the chocoalte pouring is amazing! Loving the photos! And chocolate and strawberry is probably the best combination ever. YUM! I totally agree! Thanks so much, Andrea. I whole-heartedly agree – anything mini instantly ups the cute, delicious, and fun factors! I think your drizzle of ganache is just perfectly thick and I want to shove this in my face pronto. Okay, confession: I maybe want to bathe in that gorgeous chocolate sauce! Don’t judge :) This is one babely cake and I love the strawberry + chocolate combo. Totally #winning. This is so, so pretty! And sounds seriously so delish. I love that you used fresh strawberries in the frosting– makes it such a pretty color!! Mini things are always cute! I also think the thicker the ganache, the better! Rachel, I love everything about this! Like you, I’m a huge fan of chocolate and strawberry. This cake is perfection! These photos are seriously gorgeous! And by the looks of it I imagine this tasting even better than it looks. YUMMY! This looks delicious! I love small cakes! That super-thick ganache was not a mistake. It’s screaming, “Peel me off and eat me FIRST!” Gorgeous cake. This cake is totally stunning! I love small cakes (and small things in general) and I live by my 6″ cake pan. Now you’re making me want to get a 4″ one too! Holy smoke! That cake looks out. of. this. world!